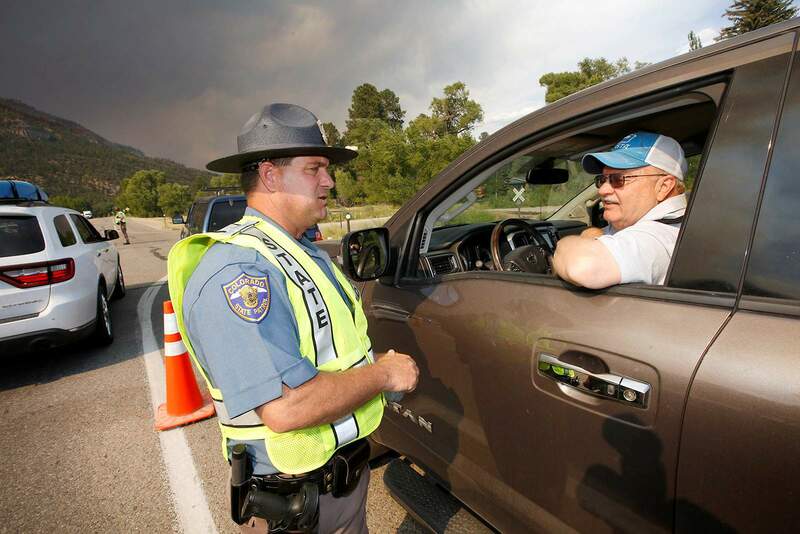 Colorado State Patrol Trooper Jason Bandy checks Joe Hardman’s Rapid Tag on Wednesday, which will allow him to return to his Rockwood home. Evacuation orders were lifted Wednesday for 560 homes and 20 businesses in the Rockwood, Tamarron and Glacier Club areas. Fire officials said Wednesday they believe the 416 Fire will burn well into July. They hope to have a containment line built around the fire’s perimeter by July 31. The Burro Fire, which is burning through the San Juan National Forest about 10 miles west of the 416 Fire and about 14 miles south of Rico, was 2,829 acres and zero percent contained. “During those 20 minutes people were texting and calling me, and I was letting them know I was safe, but at the same time I was trying to focus on what to take,” she said. “I thought: What’s the most important thing to me right now, myself, my dog, a few days of clothes and some important papers, and that’s all I took,” she said. “It was a busy 20 minutes,” she said. Residents were allowed to return from 2 to 6 p.m. Wednesday. After that, Highway 550 closes, and if they leave, they are prevented re-entry until the highway reopens, which is scheduled for 8 a.m. to 8 p.m. today with police escorts. Smith doesn’t want people to be out of their homes any longer than necessary, and he said authorities are considering reopening Highway 550 without escorts, but no formal decision has been made on when that may occur. A red flag warning is in place for today, meaning it will be hot, dry and windy. But a chance of rain creeps into the forecast for tonight, with a 10 percent chance of rain. Even better, Friday’s forecast calls for a 20 percent chance of rain during the day and a 40 percent chance of rain at night. Saturday’s forecast has a 70 percent chance of rain during the day and a 40 percent chance at night. The potential for rain is fueled from the remnants of Hurricane Bud in the Pacific Ocean. During a news conference Wednesday, incident commander Todd Pechota said firefighters haven’t received any favors from Mother Nature. Pechota said he expects the number of firefighters to grow, though reinforcements won’t come as rapidly as they have in the past couple of days. 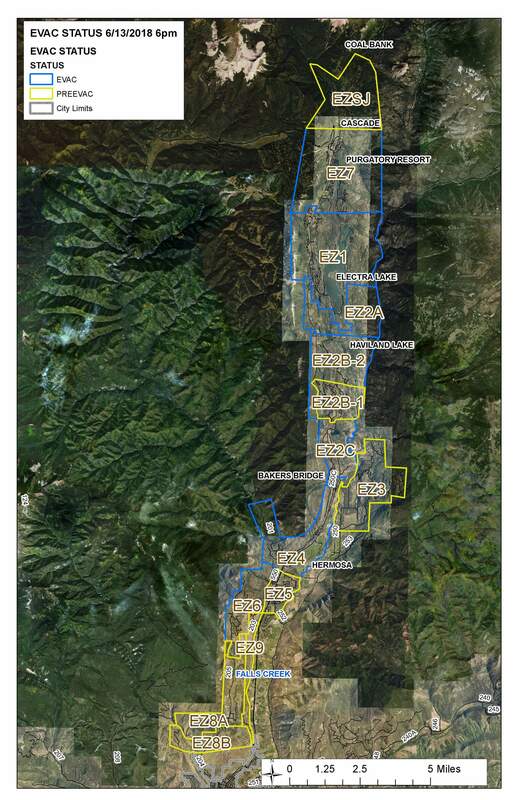 As of Wednesday, 1,232 personnel were assigned to the 416 and Burro fires. A public meeting to update residents about the Burro Fire will be held at 6 p.m. today at the Dolores Community Center, according to a news release Wednesday night from the Type 1 incident team overseeing both fires. 416 Fire June 13 The 416 Fire burns its way to the west and north on June 13 as evacuees in areas along U.S. Highway 550 are allowed to go home. The 416 Fire burns its way to the west and north on June 13 as evacuees in areas along U.S. Highway 550 are allowed to go home.